Boost the careers of your students and alumni with an easy to use, mobile-friendly job board that lets them connect with exclusive job opportunities from the employers who want to hire your grads. You need to support your students and graduates while showcasing your school’s ability to add knowledgeable people with in-demand skills to the workforce. Building relationships with employers and other industry contacts can be complicated, and you want to make it easy for them to hire your students and alumni. Is your solution easy to manage? Yes. Careerleaf’s solution makes it easy to manage job seeker and employer accounts, job board access, product pricing, and content. You don’t need a developer or IT specialist to run your Careerleaf-powered job board. Instead we deliver seamless updates on a regular basis to provide the best experience possible for your members and industry partners. Do I need to use ecommerce? We don’t plan on charging employers to advertise jobs. No, you can make job postings free for employers. You also have the option of making job posts free, but charging for featured upgrades or featured employer listings. How can I convince my school to invest in a new job board software solution? With our per-student pricing model and resources for managing your board, you can set predictable revenue goals to ensure a return on investment and present a solid business case. Security and reliability are important – how do you address those factors? 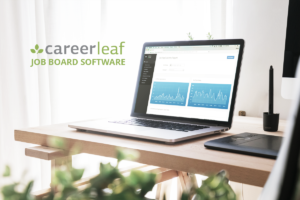 Your Careerleaf-powered job board uses a secure, stand-alone database that is not shared with any other customer, and runs on cloud-based servers with 24-hour monitoring and regular data backups. Data storage can be isolated to a specific region, including Canada, Europe, USA or Asia. How can I create a consistent brand experience for students and employers? With our white label solution, your Careerleaf-powered job board displays your own logo and colours. You have the ability to create and maintain your own branded content, and can you can place widgets on your other web properties to promote jobs and direct students back to your job board. The revenue you generate from your Careerleaf-powered board goes directly to you. If you’re planning to create a job board for your students or want to switch to a newer, better solution that adds value for alumni and employers, get in touch with us. You can request more information or a personalized demo, or have us call you for a quick chat.